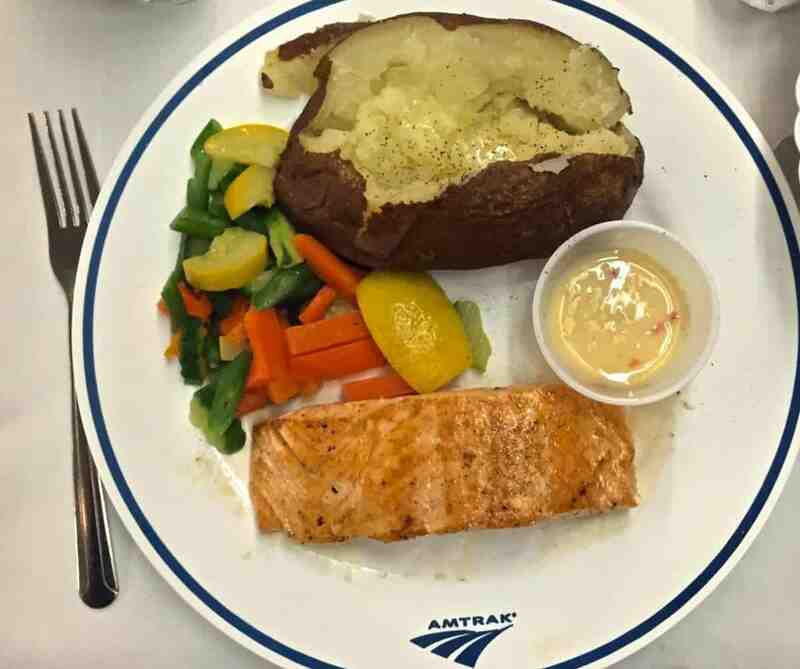 One of the best dinners onboard Amtrak Silver Star was the Atlantic Salmon with a baked potato. Will the traditional dining car become history? Last year, Amtrak made an executive decision. They decided to eliminate the inclusive meals program in sleeping car passengers’ fare aboard the Silver Star. The Amtrak Silver Star is one of two overnight Amtrak trains that run between New York City and Miami. With the removal of the dining car, a substantially lower fare for sleeping compartments on the Silver Star was possible. A savings in the range of $150-$200 less than the Silver Meteor for a sleeper on the same route. The cost of rail fare, which is calculated separately, wasn’t affected. I recently traveled aboard the Silver Star to experience the overnight trip without a dining car. Sleeping car passengers would purchase their meals à la carte in the Café Car. It seemed like a reasonable, cost-saving alternative. An Amtrak Silver Star roomette. You still get bottled water, juice and coffee…but no proper dinner. At least not until April 2016. Note to self: next time pack food. When I arrived early into New York Penn Station, I briefly thought about buying a large salad or sandwich to bring aboard the train for lunch, but without a cooler, I decided against it. It was two hours until our 11:02am departure and I had no way to keep something cold. Before I booked the Silver Star, I glanced at the online Amtrak Café menu. My favorite chipotle black bean burger was listed. That would be for dinner. For lunch I’d get snacks. All aboard and we left Penn on time. Shortly thereafter, I walked to the Café Lounge car to purchase my lunch. But the menu posted on the wall didn’t match the menu I had just viewed online. No chipotle black bean burger. For lunch, the line to order was short. Within 5 minutes I was on my way back to my roomette with a chicken Caesar wrap and a bag of chips. Holiday travel aboard Amtrak trains means sold-out capacity. On this trip, sleepers and coach seats were filled. With no dining car, nearly 400 passengers could make their way to the café car at dinner time, staffed by only one hapless soul who would have to work nearly non-stop without assistance. As of this article, here’s the “new” Amtrak Silver Star Café menu posted on their website, sans Chipotle burger. Dinner without a diner was heading for disaster. At 5:30pm when I headed through the train towards the Café car to buy dinner, there were 20 people in line from the sleeping cars. The Café Car is located between the coach cars and the sleeper cars. Thus, two lines formed: one from the coach section, which I couldn’t see, and the other from the two sleeper cars. And only one café attendant to handle it all. Back to my roomette I went. What a mistake. At 6:15 I decided to venture back to the café only to find the line had tripled. I was out of snack food. Luckily, sleeping car passengers still receive free bottled water, juice and in the morning, fresh coffee. If breakfast items sold out, I had a packaged slice of Sara Lee pound cake from the Acela lounge at Penn Station. Worst case, I’d have hot coffee and squishy pound cake for breakfast. Ask your sleeping car attendant for room service. Then I remembered something crucial on the press release. Sleeping car passengers can order their café meals from their car attendant and still have some semblance of room service. I pressed the sleeping car attendant’s call button and Nicholas quickly appeared. I handed him $20 and requested a cheese pizza, if it was still available. Car attendants don’t have to wait in line; they can go behind the café counter and purchase, prepare and head back to their car in minutes. Unless of course the line was so long that he needed to pitch in to help the overworked café attendant. Which he kindly did. About 45 minutes later, Nicholas returned with my pizza but just steps away from handing it to me, the train lurched around a turn and the small, microwave pizza slid right out of the tray. Back to the Café Car. This time, nearly 8:30pm, Nicholas safely returned with another pizza. I closed the door to my tiny roomette, pulled out the hidden table and happily ate my beleaguered pizza. I had a small bottle of wine that I brought from Europe, so all was well. This was an experiment of chaos in motion. A train full of hungry, pre-Christmas passengers and by 10pm food had nearly run out. Rumor was that more food would be delivered en route, but that never happened. The travel time between New York City and Miami is about 25 hours, if the train is on time. Without food, ridiculously long lines and no option to purchase anything during our brief station stops, passengers traveling to Florida must have been anything but thrilled. Economical coach passengers usually bring a small cooler bag filled with snacks, sandwiches and beverages for the duration of their journey. Sleeping car passengers rarely carry along food since meals are included throughout the trip. Under non-holiday circumstances, having only one person to staff the Café might have gone on without too much trouble. Unfortunately, with the Silver Star’s eight passenger cars filled to capacity, the current plan didn’t work. Is there a solution? Will Amtrak bring back the dining car to the Silver Star and subsequently raise the cost of the sleepers? Past experience has taught me that once a feature is removed from any form of transportation, it rarely makes a comeback. At first, I thought this was a good idea. Offer a cost-saving way to purchase a sleeper and experience an overnight train trip in a cozy bed. Maybe more people would buy a sleeper. Maybe not. Here are my suggestions to avoid a train full of disgruntled Amtrak Silver Star passengers who won’t want to travel again with Amtrak. Exactly the opposite of what I imagine was the intention of Amtrak with this new policy. The way I see it, there are three possible ways to resolve this disastrous situation in the future. 1. Add a second café car for the sleeping car passengers. 2. If using only one Café car, add a second attendant, one for the sleeping car guests and one for those in coach. One person simply cannot efficiently work both queues. And it will avoid ugly arguments between passengers about who was next in line. Seriously. 3. Plan for holiday crunch times and order enough food from the vendors so meals aren’t depleted and passengers are properly fed. Assuming you’ve already addressed either 1. or 2. above. When the sun came up the next day, I walked to the refreshment station at the end of my sleeper car. With a steady hand, I went back to my roomette and enjoyed a steaming cup of coffee and the still-squishy Sara Lee pound cake. No way was I about to venture back to the Café car. All was fine. « Join Me on an AmaWaterways Europe River Cruise 2017! I totally agree with you regarding those boxed meals. They are nothing more than a chemical slurry. After lengthy conversations that I’ve had with dining car crew across America, I think part of the reason for a glum disposition or outright crankiness is because of what’s happening to dining aboard Amtrak and the uncertainty of operations since the new Amtrak CEO was recently appointed. If you weren’t aware, he is a former Delta executive…and we all know the cutbacks that happened to the airline business in the last few years. All we can do is watch and wait and if possible, be vocal so that our elected officials in our state know how important it is to keep and maintain our long-haul railroad systems as well as provide quality meal service and clean accommodations. Thank you for your important comment. The new menu for the box lunch was awful traveling from Chicago to DC..no chicken and only very few options. From Florida to Chicago you will take two trains. The way Amtrak routes you is first on Silver Meteor (with a dining car) and then in Washington DC you’ll most likely change to the westbound Capitol Limited which, as of a month ago due to budget cuts, no longer has a dining car. Sleeping car passengers will receive a boxed cold meal plus complimentary wine, beer or soft drink. Coffee and tea are always available and there will be a snack car as well. At least one segment will have a diner. Have a nice ride and enjoy Chicago, my hometown. I will be traveling from Florida to Chicago August 6, 2018. Will there be dining (meals) not just snack foods? We always look forward to eating in the dining car. In addition to the loss of the diner, the Star has only one locomotive instead of two which is a major factor in the cost cutting intent. That, however, will cause yet more delays due to inevitable breakdowns as these locomotives are quite old. Privatize diners to a commercial company, as in Europe, and they make money. But, until our leaders realize that train transportation is as much a public service as is electricity, water, and airports ( already subsidies heavily by the government), third world countries have far better service than here in the US. Thank you for your comment. Sad to see the dining car disappear on Silver Star. The price differential can vary between Star and Meteor as well as between bedroom and roomette. I’ve seen all sorts of prices and they fluctuate all too often. Let’s hope there are not going to be any more cuts in service. Happy travels! I think ur comment of 6/13/2017 is incorrect! The cost difference between the silver star to the silver meteor on first class ( roomette/bedroom ) is 90-120 $ ! The cost difference between a roomette and bedroom is300$ plus! I have been riding from phila to Miami when amtrak was the seaboard coastline railroad . Circa June 1961.last traveled nov 2016, wrong move to remove the dinning car, but we r only the customers that use the service, congress, and the ceo’s only care that they get $, nothing more! Funny how congress expects Amtrak to make money (which honestly it breaks even…not billions in losses) but the Airline industry is ok to get $20 Billion in subsidy annually…not sure if that includes the Gov provided infrastructure with airports etc. I’m glad your train experience was successfully salvaged with the Silver Meteor! It really makes a huge difference and it’s a shorter train ride, too. I just rode on the Silver Star to New York last week (the Meteor was sold out) and I brought with me a $1.99 styrofoam cooler. I packed it with three frozen water bottles (and refilled the cooler with ice onboard) and brought yogurt, a salad from Trader Joe’s (it was near the station in Florida) a banana and a carton of milk for a cup of cereal I had in my overnight bag. On board, as soon as I boarded in Florida, I ran to the Café Car and bought their hummus and pretzels and a bagel and cream cheese, which went into the cooler. Of course it didn’t compare with breaking up the trip with the dining car 3x a day, but at least I had decent food and for the price difference between Meteor and Star, I was able to afford a Bedroom instead of a Roomette. When we arrived into NYC, I emptied the cooler and gave it to one of the crew members to keep. I hope you’ll continue to ride the train when you can. Thank you for your email! Happy travels! We just had our first train experience taking the kids on the train to Disney from Baltimore. We had the Star going down and the Meteor coming back. We were disappointed to find no dining car on the Star. Yes the cafe car was crowded and dissatisfied with the microwave food options. I was dreading traveling back north. To our surprise yesterday, as soon as we boarded, our attendant shuffled us right to lunch on the dining car! The kids really enjoyed table service on the train. Lunch, dinner and then breakfast really helped breakup the time spent on the train. The dinner will be back on the Silver Star just as it will be on The Lake Shore Limited. The current single level diners are in such bad shape that there aren’t enough to serve The Star, Meteor, Cresent and Lake Shore Limited and still have spares to swap out as needed. Once the “mythical” new diners arrive, they’ll be placed back on the trains that lost it. (At the rate CAF is building them though, it’ll seem like a permenate loss at present.) In the meantime, if you need dinner, take the Silver Meteor (unless you’re going to Tampa) or buy food in NYP before departure, in Washington during the engine change (if on time) or order delivery and have them meet the train at Richmond or one of the other crew change stations where you’re scheduled to be there at least 15 minutes (just make sure the train is on time if you decide to take that option). I’m a loyal Amtrak patron. Remove either sleepers or diners and, I’m through! From the sounds of Amtrak forums in social media, there is a good chance that one of the sleeping cars currently constructed is reserved for Silver Star. And great news: Rep. John Mica lost his election 51.5%-48.5% in November to a Democrat. You’d wonder if his vociferous rantings led people to fund and vote for his opponent. Being that his district was in the Orlando area there’s the chance that a number of his constituents make the trip north. I’ve rarely taken sleepinig car; yet frequently go long distance, every time using the dining car. I’ll gladly pay more for reliable quality food. On Paul’s point- eliminate sleepers and dining cars and the experience will worsen. The subsidy that sleeper uses provide to the rest of the train will be lost as fewer will tolerate the cheaper class lower quality experience. Actually, the sleeping car customers help subsidize the rest of the train. The argument should instead be made to increase the number of sleepers. Long distance trains aren’t really used for “economy” travel; that’s Greyhound, Megabus and Southwest Airlines territory. The strongest evidence for this is that every train, without fail, will have sleepers sold out weeks in advance long before the last coach seat is filled (if at all). This happens even on trains which have more sleepers than coaches, such as the California Zephyr. It’s no coincidence that the two almost profitable LD trains are the Auto Train with 6 sleepers and the Silver Meteor with 3. For reference the rest of the east coast has only 2 sleepers/train and half of one is always needed by the crew. Both high earning trains also have dining cars; in fact Auto Train has 2 diners and a lounge! Sleeper customers can also absorb fare increases more easily – a $20 fare increase on a coach seat can make-or-break a customer’s decision to use the train. A $20 fare increase on a sleeper isn’t even considered. If Amtrak is to become profitable for LD trains, they need to treat their luxury product (dare I say “Land Cruise”) differently from the government subsidized essential transportation the coach section provides. And that means, dining cars with corresponding higher fares. Amtrak loses approximately $70 to $80 million per year on its food and beverage services. Roughly 85 per cent of the loss is attributable to the long distance trains. The Silver Star, as well as the Silver Meteor, are long distance trains. If Amtrak were operated like a real business, which was the original intent, or if it made money, offering food and beverage services as a loss leader would be acceptable. But Amtrak does not make money. Last year it lost $1.2 billion. Amtrak must find ways to cut its losses, which means reducing its reliance on taxpayer subsidies. Cutting the dining car on the Silver Star is a good decision. A case can be made to eliminate the dining cars and sleepers on all the long distance trains. Upgraded lounge cars – properly staffed – and business class cars equipped like overseas airliners would be good options. These steps could reduce the loss on the long distance trains – approximately $600 million in 2015 – and help ensure their survival. Thanks for your comment, Louis. It’s been an uphill battle forever. Thank the republicans and their anti middle class, anti union stance for this. If they had their way there would be no Amtrak along with SS or healthcare to name a few. The photo at the beginning is quite misleading; this is a dinner that once was served on the Silver Star, but is not now. You’ll have to ride the Silver Meteor to have a chance for a real dinner. Thanks for the update, Craig. That’s kind of what I thought would happen. Hopefully they’ll consider adding a second cafe car or at least a second cafe attendant to handle the hours-long wait in line. What a shame. BAD news. According to my sources in the know the diner elimination is now permanent. Sorry folks. Until you vote John Mica (Amtrak public enemy number one) out this is how it’s going to be!!!!! Thank you all for your comments. Much appreciated. I didn’t intend for it to sound as though I was blaming Amtrak. Sorry if that was how it sounded and thanks for clarifying. Next on the list is restoring Jax to NOLA service. This “Executive” notion is Idiotic. I am really pissed off as I use the Silver Star frequently. Representative John Mica (R-FL) was the person who pushed for the elimination of this trains dining car service. Mica emotes about all Amtrak food service and Train 91 and Train 92 were offered up as sacrifical lambs. Write Rep. John Mica. Don’t blame Amtrak. Mica offers up all manner of reasons to complain about Amtrak food service. The real reason he despises the food service is that all the employees are in unions and he despises all unions. You can thank Congress for this. They backed Amtrak’s CEO into promising to eliminate losses on food service. If you don’t serve food you won’t lose money on serving food.